In April, the first of three trials over the 2014 armed standoff between supporters of rancher Cliven Bundy and the federal government ended. As of press time though, the jury had not yet reached a verdict. The standoff and ongoing court battles reflect a longstanding war in Western states over public lands. Throughout the deliberations for the first round of defendants, prosecutors and defense described the 2014 events in starkly different terms: The government portrayed the showdown as terrifying for federal officers who were merely following court orders to round up cattle that had been illegally grazing federal lands. The defense team depicted their clients as standing up for what they believed in and attending a protest. Charges included conspiracy and threatening a federal officer. Bundy and his sons are expected to go to trial in late May or early June. 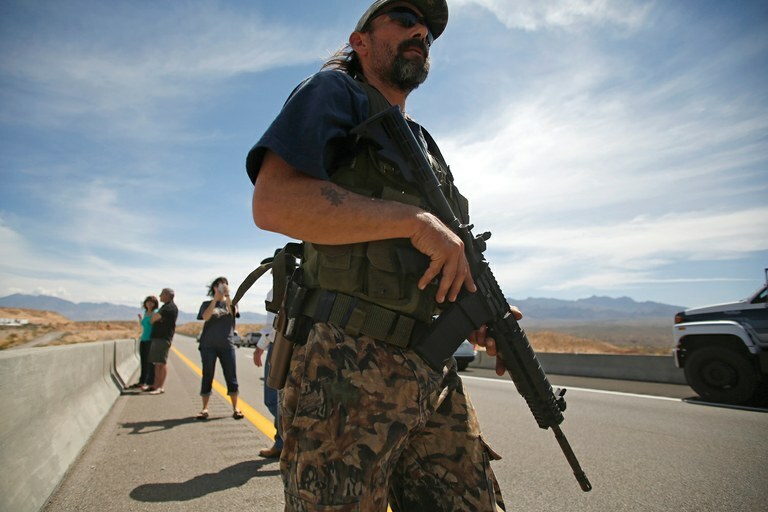 Scott Drexler, one of the six defendants currently on trial in Nevada, carries a rifle near the BLM base camp during the standoff over Bundy grazing rights in April 2014. Cliven Bundy and sons Ryan and Ammon are scheduled for trial this summer. Gov. Jerry Brown declared California’s latest drought over for most of the state in April, but the consequences of the dry period and long-term water issues still trouble the Golden State. Sucking up groundwater faster than nature can replace it has been a problem for decades, and it will likely be decades more before it stops. Pumping intensified during the drought, exacerbating problems like dried-up domestic wells — leaving households without running water — and land subsidence, which can damage roads and other infrastructure. Ecosystems suffered, too: Vast tracts of trees died, and salmon and migratory bird populations declined. In March, the House passed two bills aimed at defanging the Environmental Protection Agency. House Bill 1430 limits the EPA’s access to scientific data. House Bill 1431 replaces scientists and public health experts on its advisory panel with industry members and politicians. As of press time, the Senate had yet to schedule a vote on either bill. What data will the EPA be allowed to use? Only data that it makes publicly available. To keep protecting patient privacy and private business concerns, the EPA will have to stop using much of its current data. What about data you can’t reproduce? It can’t be used. This rules out data sets on environmental disasters, such as oil spills, and public health disasters, such as radiation exposure. What is the “best available science?” The EPA has to use “the best available science” to support its actions, but that’s not a defined legal or scientific concept. This could stall any new regulations. How much will it cost? Although EPA staff estimated the bill’s cost at $250 million per year, House Bill 1430 caps implementation spending at $1 million per year. Who’s giving the EPA advice? House Bill 1431 changes the composition of the EPA’s Science Advisory Board (SAB), which advises the EPA administrator. The bill excludes scientists with ongoing work relevant to the question under review, likely resulting in the inclusion of more industry members. How will the public participate? Under House Bill 1431, the SAB will lump public comments, counting all copies of form letters and electronic petitions as one single comment. 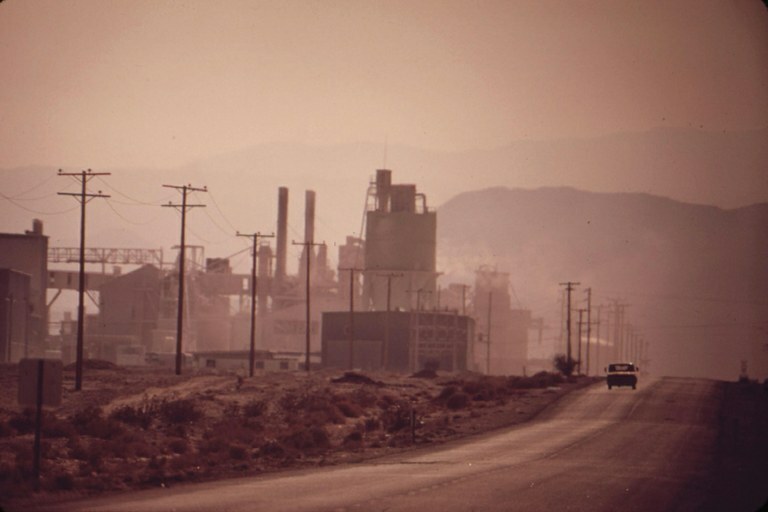 Environmental disasters in the industrial East and Midwest sparked the creation of the EPA nearly five decades ago, but polluted places dotted the West, too. Heavy metals spewed from smelters, waste was dumped into ponds, and the sky was clouded by lethal smoke and haze. Although problems persist today, they’re generally much less severe now — but the region is at risk if regulations are revoked or a slashed budget leaves them unenforced. 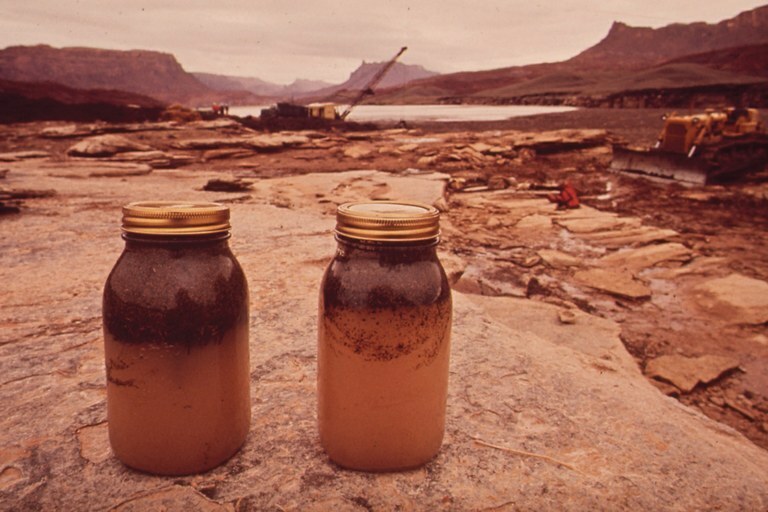 Water samples taken in 1972 after a pipeline burst, releasing crude oil into Utah’s San Juan River. —Coal executive Robert Murray (quoted in The Guardian), who advised Trump that low-priced natural gas and mechanization makes it unlikely that the tens of thousands of coal workers laid off in recent years could return to work. Interior Secretary Ryan Zinke’s first act on the job was to repeal a ban on the use of lead ammunition in national parks, wildlife refuges and any other public land administered by the U.S. Fish and Wildlife Service. The order had been put in place during the last days of the Obama administration. Lead bullets fragment, leaving microscopic traces in hunted animals. In an opinion column, Bette Korber writes, “Residual lead from bullets is a serious issue for endangered condors, other birds and animals, and very likely for people” — from unintended exposure to toxic lead in their meat. Scott Page: “Anybody ask the California condors what they think of this decision?"